Volveremos! We Choose: Renewable Energy. People’s Power now! 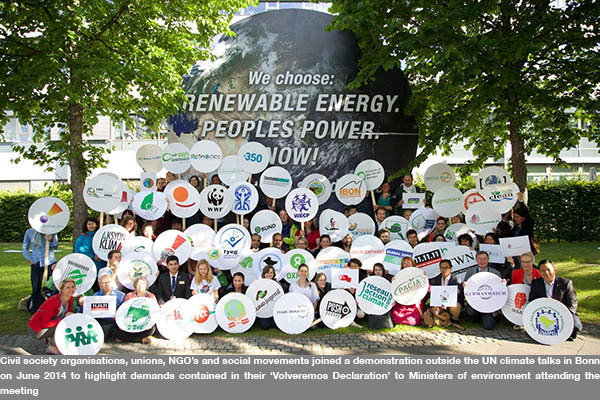 BONN, GERMANY (June 6, 2014)- More than 100 people held a demonstration in Bonn today, outside the hotel where the Ministers of Environment were meeting at the UN climate negotiations. Organisations from every continent – including trade unions, social movements, environmental groups, gender and youth groups, indigenous groups and NGOs –are demanding action by the more than 198 member governments of the UN Framework Convention on Climate Change (UNFCCC). A Declaration was handed overto the Minister for the Environment for Peru Manual Pulgar-Vidal; Laurence Tubiana, recently nominated special envoy for the French Foreign Affairs Minister, and Venezuela Vice-Minister for Foreign Affairs Claudia Salerno Caldera, listing demands. International civil society organisations demonstrated their rising dissatisfaction with the direction of the UN climate negotiations in Warsaw last November, staging an unprecedented mass walkout. The demonstration in Bonn is intended to show the growing public support for climate action and a just energy transformation. The groups held a banner: “We Choose: Renewable Energy. People’s Power now! The Declaration lists 7 specific demands of the groups, and then concludes,“the global climate movement is building its strength and power in every country of the world. We call on those who claim to represent us to either act in our interests or step aside.